Dolly The Mountain Biking Sheep! We had a great time during our visit to Diablo Freeride Park. Utilizing the excellent lift service and facilities around the mountain, we were all business (riding that is) on Saturday. However, during our little after hour party Saturday night, we plotted to have of some fun before we packed up & returned home. Dolly the mountain biking sheep made her debut in front of the camera on the shoulders of "The Doctor" as he ripped up the trails at Diablo. 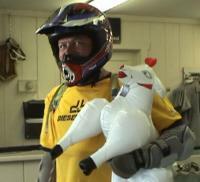 This fun, yet head turning skit was a blast to film with many people wondering…"Was that a sheep on that guy’s back?" Beware, this video contains adult humor. Nothing really bad; but bad enough to make you say "WTF". The class professor is Crazy Fred and his students are those rides that want to step up their game. This video contains Chapter 05 of our lessons to freeride. 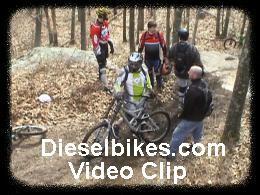 Well, they are not really lessons but short video segments of stuff that happens on Dieselbikes' group rides. The class professor is Crazy Fred and his students are those rides that want to step up their game. This video contains Chapter 12 of our lessons to freeride. 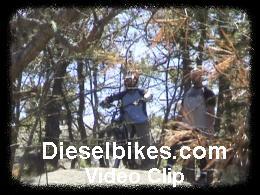 Well, they are not really lessons but short video segments of stuff that happens on Dieselbikes' group rides.